It’s interesting how, since winning multiple Oscars for The Hurt Locker, director Kathryn Bigelow and writer Mark Boal have stuck strictly to war docudramas, with Zero Dark Thirty a few years ago and now Detroit. Both take very different perspectives when it comes to war, with one focusing more on the intense work behind the scenes while this latest one focuses far more on the actual experiences of those literally caught in the crossfires, but you’re probably not thinking about that right now because you’re asking yourself: what constitutes Detroit as a war film? Isn’t it a film that’s just about the race riots of 1967, and definitely not something set in Iraq, Vietnam and other actual war environments? Well, from the way it’s shot, directed, acted et al, it might as well be a war film because this contains some of the most intense sequences you’ll see in a long time, and leaves you just as traumatised and as disturbed as the people who most of the violence is directed towards. 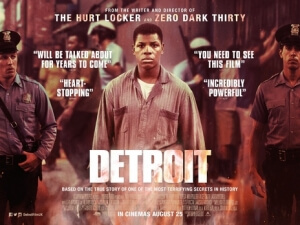 Basically, Detroit is a very different kind of war movie, and it is just as brutal as some of the more violent entries in the genre. If you’re not caught up on 20th century American history, in 1967 the streets of Detroit become a battleground for African-American citizens who are clearly fed up with the brutality of the local police force when it comes to arrests of their own brethren. Everything and everyone is already tense enough as is, with stores being looted and vandalised, police patrolmen chasing down and shooting unarmed civilians based purely on suspicion, and things getting so bad that the National Guard is called in to enforce a curfew. It is on the third day of these riots, however, that the most brutal incident takes place; at the Algiers Motel, something of a safe haven for black citizens, a prank involving a starter pistol alerts the police and the military to the compound, when they are convinced that a sniper is located in the building. To gather answers, a trio of patrolmen (Will Poulter, Jack Reynor and Ben O’Toole) round up a group of mostly black youths and beat, intimidate and even threaten death towards them if they don’t fess up about the location of the weapon. By the end of the night – and this is no spoiler since, y’know, history – three people will have been shot and killed, several others assaulted, and the cops would saunter on like nothing happened. It’s no coincidence that Bigelow and Boal decided to make this movie now, with race relations in this day and age not being that much different to how it was fifty years ago, and recent riots in Ferguson and Baltimore among several other locations that occurred due to police treatment of black civilians being depressingly par for the course in this seemingly never-ending battle against racially-motivated law enforcements. Boal, just as he did with Zero Dark Thirty, puts together an effective dossier of events in this particular timeline, comprised of archival photos and footage from the real incidents along with the re-enacted scenes of violence and intimidation, and Bigelow brings it to life with her natural ticking-bomb approach to intense filmmaking, which keeps you on edge throughout the entire film and especially during the scenes at the Algiers, which makes up the main centrepiece of the film and takes up a large bulk of the screen time. It is this extended sequence that can become the most difficult to watch, because you are right there with these victims who have done nothing wrong yet are treated to the most inhumane levels of interrogation by these intimidating and cruel policemen, especially their de-facto leader Poulter, who has never been more effective and terrifying in a performance than he is here. Bigelow makes you feel every punch, slap, verbal insult and gun shot, leaving you just as discombobulated as the victims, and it is expertly directed and acted by everyone involved to really make you feel like you really are in the middle of this completely brutal exercise of force. Like Dunkirk, the film is an ensemble piece with no one character being singled out as a lead by any means, and though John Boyega is central to the film’s advertising as a security guard caught up in the madness, his is just one of multiple interconnecting storylines that range from a struggling band of musicians to an army veteran who happens to be caught with a pair of white girls, all of whom would eventually tie in to this one devastating event. The fact that there is no one audience surrogate allows us to see this whole thing through the eyes of many different people, including the police who, despite their villainous presence, are still written as three-dimensional characters you can reluctantly see where they are coming from, and part of what makes this a particularly strong example of intensity from both Bigelow and Boal is that you can see how many lives are ruined or forever altered due to the horrific treatment they go through. It is a very bleak movie, one that doesn’t really have a happy ending, but once it does end there is still this bittersweet feeling of hope buried somewhere in between the melancholy, which a lot of the most effective war movies seem to nail almost perfectly. This one does that too, but it’s one hell of a rough journey to get to that point. Detroit is an intense and well-researched docudrama depicting the horrific display of police brutality during the Algiers Motel incident of 1967, which leaves you just as traumatised as the on-screen victims and with a sense of shame that such incidents could happen without justice, making it a very timely movie for this current climate of civil unrest.